The Barons play out off Solihull Ice Rink. From the M6 you will need to exit at junction 6 and follow the directions for the NEC/Birmingham Airport. Take the A45 towards Birmingham and continue straight ahead until you get to the overhead gantry traffic lights. Follow the ice rinks brown tourist sign turning left onto Hobs Moat Road. From the M42 you will need to exit at junction 5 and enter the A41 Solihull bypass towards Solihull until you get to junction B425 Lode Lane. Turn right into Lode Lane and follow the ice rinks brown tourist sign continuing straight ahead until you enter Hobs Moat Road. From Birmingham Centre take the A45 out of the City through Small Heath and Yardley. Take the B425 and continue straight ahead until you get to the overhead gantry traffic lights. Take the right lane and turn right onto Hobs Moat Road. 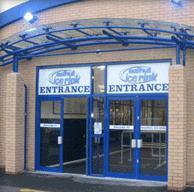 To enter the car park go past Solihull Ice Rink and turn right into Ulleries Road and next right by Fitness First. There is a fee payable for parking before 6pm. Barons games will generally be weekend evenings. If coming by public transport we advise you to check schedules with Traveline West Midlands. Coming by rail: a train from Snow Hill station will take you to Solihull station. You will then need to catch a bus to the ice rink. There are regular buses which can be caught directly outside the station. Coming by bus: the 71 and 72 Solihull buses stop in front of the ice rink. The 58, 60 and 900 Birmingham buses stop on the A45 Coventry Road (approximately 10 minutes walking distance to the ice rink).